Titan's windswept dunes may sprawl millions of more kilometers than previously thought and were likely formed by geological processes similar to those on Earth, according to a new study. The new findings could help scientists look for life or its molecular precursors on Saturn's largest moon. The study, published in the Journal of Geophysical Research—Planets, a publication of the American Geophysical Union, uses new maps of Titan to explore two questions about Saturn's largest moon: How are Titan's dunes formed, and what are they made of? Titan's atmosphere is incredibly dense, with thick layers of organic compounds floating throughout it. Peer through that atmosphere, however, and you'll see a frigid landscape not unlike Earth's arid deserts. Titan's surface holds valleys, canyons, lakes, mountains and dunes. Many of these Earth-like surface features exist in part because of Titan's weather system, where liquid hydrocarbons, like methane, rain from the sky. The geological process behind these dunes may be similar to those that etch Earth's canyons and river channels, according to the new research. 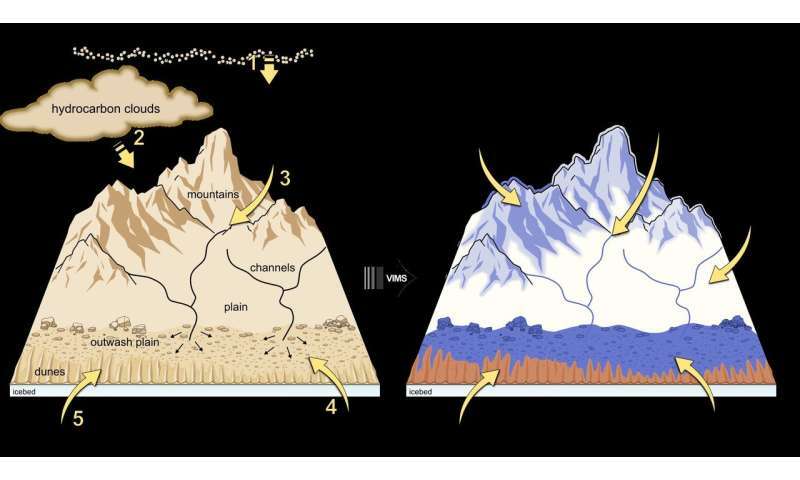 Just as rains slowly cut canyons and channels on Earth, Titan's hydrocarbon rains kick off a process that begins at the top of the moon's equatorial mountain ranges and ends in its sprawling dune plains and dust storms. In analyzing the most detailed images of Titan's equator to date, the study's authors also suggest the dunes cover much more area than previously thought. The dunes extend three million square kilometers (more than one million square miles) further than previous estimates, the equivalent of ten Namib deserts, according to the new research. Because Titan has a nitrogen-rich atmosphere, active weather system and organic compounds on its face, its surface could be hospitable to life or its prebiotic constituents. Understanding the geological processes happening there could help scientists uncover where life might be, said Jeremy Brossier of the Institute of Planetary Research in Berlin, Germany, and lead author of the new study. Brossier said the new study bolsters some early hypotheses about Titan's surface and provides "very strong evidence" that water ice is both exposed on Titan's face and present throughout the dune-forming process. Scientists first peered closely at Titan's surface using the Hubble Space Telescope in 1994. Researchers then believed the large, dark regions around Titan's equator were liquid hydrocarbon lakes. Years later, scientists now know those large dark regions first spied by Hubble were not lakes, but in fact expansive plains streaked by dunes. That observation came courtesy of the spacecraft Cassini, which launched in 1997, burned up in Saturn's upper atmosphere in 2017, and carried instruments used to peer closely at the icy moon's surface. One of those devices was Cassini's radar instrument, SAR, which showed researchers the shape of Titan's surface by bouncing radio waves off the moon's face. Switch SAR on, and mountains, valleys, and even canyons come into view. Mapping the shape of Titan's surface is a crucial first step in understanding the geological processes that unfold upon its frigid landscape. But figuring out what these surface features are actually made of—be they ice, rocks, sand or other material—is entirely different. To do that, scientists had to use a different instrument: VIMS. VIMS is like a camera. But unlike most cameras, VIMS records images in 352 different colors and registers wavelengths of light between 300 and 5100 nanometers. The human eye, by comparison, only registers between 380 and 620 nanometers. Analyzing these wavelengths allows researchers to infer what Titan's surface is likely made of. Every compound reflects light differently, creating a light signature. Scientists like Brossier use these light signatures to narrow down what a surface feature's topmost layer—the only layer VIMS can see—is made of. In the lab, Brossier and his colleagues modeled varying mixtures of substances that are likely to be on Titan's surface, and assessed their spectral properties, or light signatures. They used that information to build a model that would later guide them through the different light signatures that cropped up when VIMS took pictures of Titan's equator. How did Titan's dunes form? 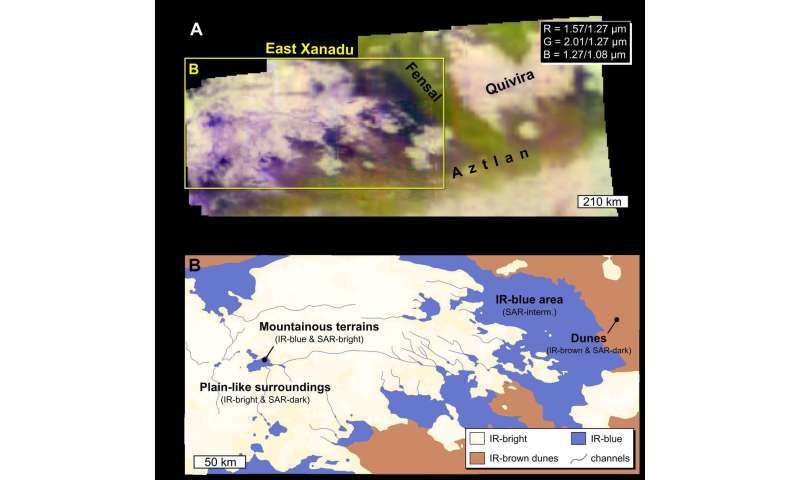 Using the new images from VIMS, the study's authors proposed a dune-forming geological process beginning at the very top of Titan's equatorial mountain ranges. There, Titan's dense atmosphere continuously lays down coat after thin coat of organic material, like a powdery layer of freshly fallen snow. That thin coating is rich with small, organic molecules known as tholins, which registered as highly reflective in Cassini's instruments. Brossier and his colleagues used the light signatures of those tholins, along with water ice, to tease out the geological process that produces Titan's dunes. The new study suggests methane rains erode Titan's mountaintops, cutting channels into the terrain. That erosion washes tholins and ice chunks down from the mountaintops into lowland basins where they accrue. Titan's winds then blow the mixtures' smaller grains away from the basins and toward its equatorial dune plains. These small grains accumulate to form Titan's dunes. This process is similar to how dunes form on Earth, Brossier said, except the materials that ultimately compose Titan's dunes come from its atmosphere. That thick, dense clouds of organic aerosols feed layer after layer of organic material onto Titan's mountaintops, which methane rains wash away and toward the dune plains. The study provides strong evidence of exposed water ice at some small areas and its geological role in the formation of Titan's dunes, according to Brossier. "One of the most debated topics was the arrangement of water ice on Titan's equator," said Brossier, who added that some researchers believed there was no water ice exposed on Titan's surface at all. "We not only found signatures compatible with water ice in a few areas in this study, we also showed that we now have the techniques needed to understand Titan's surface." The presence of dunes seems to be considered anomalous more often than not. Same goes for "volcanoes" and outgassing "vents" on what should be geologically dead bodies, such as moons and asteroids. This is because scientists rely on processes that currently (and slowly) shape earth's surface. It's a valid assumption to apply these same processes (wind erosion, fluid erosion) on other bodies because time is a variable scientists can always bend to fit their theory and can rarely be disputed. But when the assumption leads to ever-increasing complexity eventually we must revisit that first assumption. What if another method of geological erosion is responsible? One which predicts that you MUST find sandy dunes, you MUST see dust being expelled from surfaces, you MUST see clean-cut ridges and craters with flat floors and steep walls. The influence of electric discharge 'machining' of these charged bodies spinning in plasma cannot continue to be ignored. ross, you may find observed data as anomalous. Those comicbooks you are relying upon to inform you? Make bogus claims that "scientists rely on processes" that are anathema to your thundermug cult. Your primitive worship of the thunder gods does not make anything you do 'scientific'. No, I don't find the observations I mentioned anomalous. So if there are peculiar geological processes occurring (see "cryovolcanism") and we know that the charged, rotating bodies (moons, planets, comets, asteroids, etc.) are connected via electric currents... then why is it pseudoscience to investigate if these forces play a role on the respective surfaces?